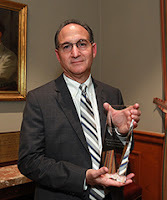 In a ceremony yesterday evening at the United States Supreme Court, Florida Judge Steven Leifman, J.D., was honored with the 2015 William H. Rehnquist Award for Judicial Excellence from the National Center for State Courts for his work on behalf of people with mental illness in the Miami-Dade (Fla.) County criminal justice system. Leifman, who also serves on the board of directors of the American Psychiatric Association Foundation, has both advocated for and implemented programs to divert from county jails into treatment and community support people with mental illness who do not pose a risk to public safety. APA President Renée Binder, M.D., who attended the ceremony, noted that the award to Dr. Leifman highlights the national recognition by the judicial system of the inappropriate criminalization of persons with mental illness. "Chief Justice John Roberts listened carefully while Dr. Leifman gave an elegant and passionate speech of his experience as a sitting judge and seeing defendants with obvious mental illness and confusion who had committed minor offenses and were being sent to jail inappropriately," she said. "APA is working collaboratively with Judge Leifman and with other stakeholders to highlight this problem and address solutions."